Christmas, 1864. With the nation at war, it is not a silent night. All is not peaceful or bright. On one side of the Potomac, an escaped slave hurries her daughter toward the capital and freedom. On the other side, a young Confederate runs away from home with hopes of joining the fight. In the capital, Mrs. Lincoln is in desperate need of the perfect gift for her husband Abe. 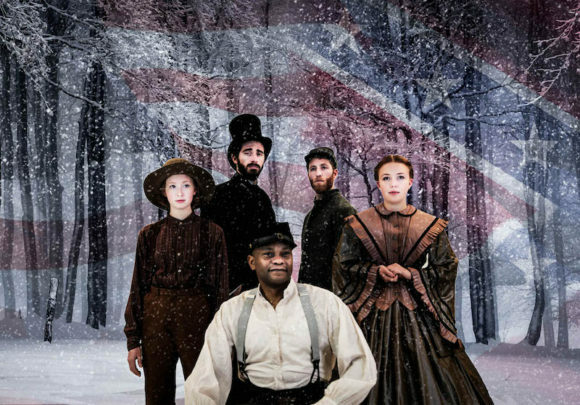 Pulitzer Prize-winning playwright Paula Vogel creates a historical and musical masterpiece in “A Civil War Christmas,” one that is uniquely American. In the shadow of our own partisan divide, can the nation put aside its differences and share in the hope and generosity the Christmas season has to offer, and the promise of Christmas future? Connecticut Repertory Theatre (CRT) continues its 2018-19 season with “A Civil War Christmas: An American Musical Celebration.” in the Harriet S. Jorgenson Theatre on the UConn campus at Storrs from Nov. 29 through Dec. 9. The ensemble cast is led by Tony Award-nominee Forrest McClendon. McClendon is a UConn alum and grew up in Connecticut. He last appeared onstage at Connecticut Repertory Theatre in “Peter and the Starcatcher” in 2016. McClendon is a Tony Award nominee for his Broadway debut as Mr. Tambo in “The Scottsboro Boys,” first created at the Vineyard and Guthrie Theaters. Post-Broadway, he received a Barrymore Award for his reprisal of the role at the Philadelphia Theatre Company. He also starred in the London premiere at the Garrick Theatre, which received the London Evening Standard Award for Best Musical, and he is featured on the Off-Broadway and West End recordings. Forrest received his Bachelor of Music in Vocal Performance from UConn, and made his professional debut as the Padre in “Man of La Mancha” at Nutmeg Summer Theatre. Tabatha Gayle is an AEA Jamaican-Asian performer, multidisciplinary creative, and activist based in NYC. A 2018 BFA Acting graduate of the University of Connecticut, she performed with the Connecticut Repertory Theater in productions such as ‘The Importance of Being Earnest’ (Gwendolen), ‘Shrek The Musical’ (Humpty Dumpty/Soloist), and ‘Our Country’s Good’ (Mary Brenham). Director Elizabeth Van Dyke serves as the Producing Artistic Director of Going to the River and The River Crosses River: A Festival of Short Plays by Women of Color. These programs support and champion the work of African-American Female playwrights and women playwrights of color. The artistic home-base for these programs is the Ensemble Studio Theatre in New York City. The creative team includes: Elizabeth VanDyke (Director), Anna Brewster (Scenic Design), Matt Lazarus (Lighting Design), Corey Brittain (Costume Design), Mitchell Prescott (Sound Design), Lizz Mangan (Dramaturg), Paul Feyer (Music Director), Caitlin O’Rourke (Production Stage Manager). Evening performances start at 7:30 p.m. on Wednesdays and Thursdays, and at 8 p.m. on Fridays and Saturdays. Select matinee performances start at 2 p.m. on Saturdays and Sundays. Single tickets are available now. Single tickets range from $36 to $40. All student tickets are only $10 and there is always a senior discount. Call the box office at 860.486.2113 for tickets and additional information or visit www.crt.uconn.edu for specific show dates and times because performance schedules vary and are subject to change.